Wearing makeup in the summer can be difficult. I mean who wants to wear foundation when it's hot and humid? I'm also someone who sweats easily so I need a lightweight foundation that lasts a long time and covers up redness. 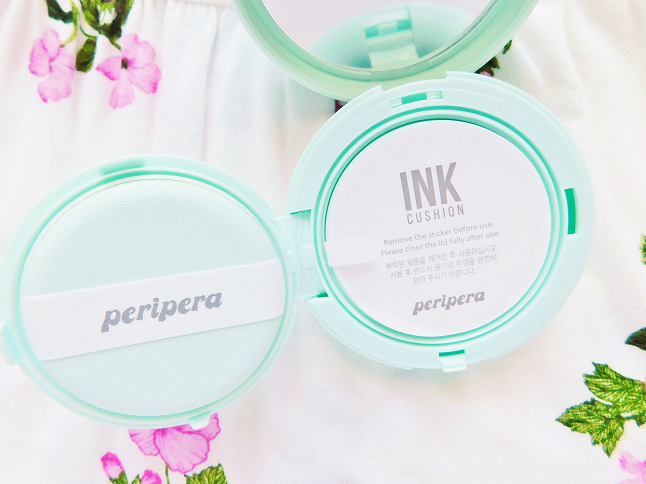 Enter the Peripera Ink Lasting Mint Cushion. 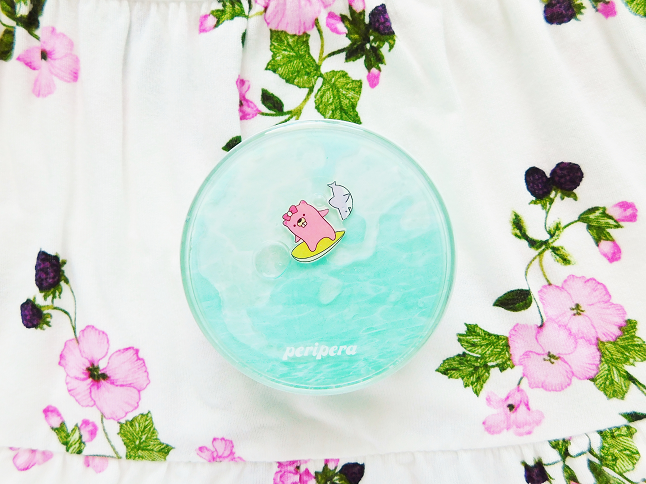 This cushion caught my attention because of the adorable Perikiki packaging which is limited edition and only here for the summer! It is also a mint cushion which means it was designed to calm redness. I've used this on work days, outdoors, and even indoors when I'm just chilling at home. I've tested this cushion enough times and in various environments so how well did it hold up in summer? Is it the summer cushion of my dreams? Keeping reading to find out! There are three shades to choose from #1 Ivory (19 pure ivory), #2 Beige (21 natural beige) and #3 Sand (#23 healthy sand). I picked shade #2 beige even though I normally picked shade 23 in Korean foundations because sand looked too dark for my skin. Beige was a bit too light for my face but I would rather have a lighter shade than a darker shade because you can always darken a lighter shade with a powder. There is also a pink ink lasting cushion which is for brightening and a lavender cushion which is for whitening but I went with the mint one because I experience redness when it gets really hot outside so anything to help conceal that is a win-win for me. "A single touch is enough to cover and blur the skin with redness and troubles with the smoothness. The ink lasting effect maintains the make-up and the freshness for over 6 hours." Let's start with the bad things first like the cushion puff. I didn't like the puff. It's too thick and spongy which makes the application kind of uncomfortable at first. 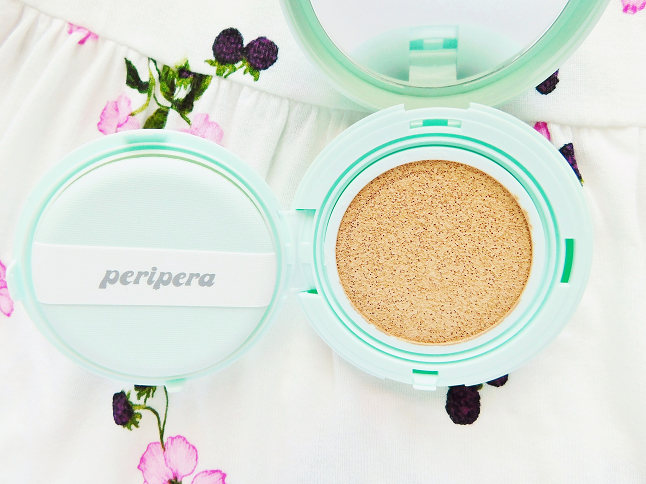 I prefer thinner cushion puffs because you can control the foundation better. The coverage of the cushion is light to medium so blemishes can still be seen it is buildable.though so you will need concealer. My favorite thing about this cushion is the natural finish! The blurring effect hides blemishes and pores making the skin appear smooth, healthy and fresh! This is the perfect daily summer cushion especially if you want a "no makeup look". After a couple minutes the cushion sets to powdery finish, not completely though. Another thing to keep in mind is that this cushion gets oily throughout the day so if you are looking for a matte cushion this isn't for you. Now onto the redness. This cushion contains tea tree, peppermint, Centella, and Boswellia these ingredient help whitening, reduce redness, and a soft blurring effect. It did cover the minimal redness that I have on the sides of my cheeks so if you have a little bit of redness and looking for a cushion that can cover that up without layer too much product I would recommend this cushion. 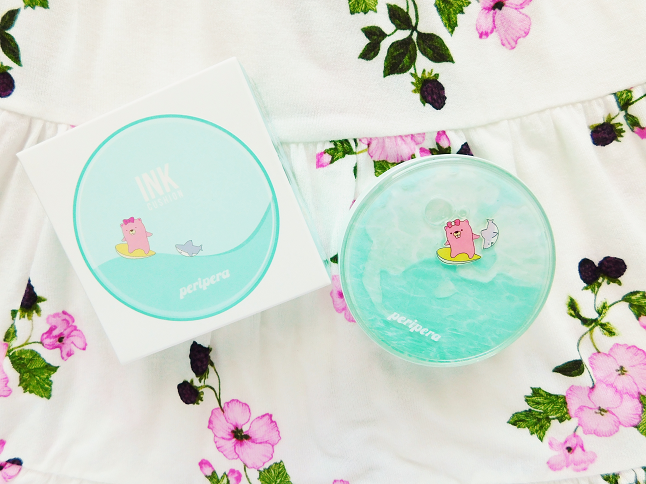 You can purchase the Peripera Ink Lasting Mint Cushion here (Perikiki packaging) or here (regular packaging). This is so cute. I have dry skin. I guess it will get worse if I try the mint cushion.